Union Bay Trustees Finally Have Orientation April 29, 2017. Will They Learn Anything? Tomorrow, April 29, the five neophyte trustees will finally have some direction. The following is the email I sent with my concerns. Will they be able to grasp what they are told? 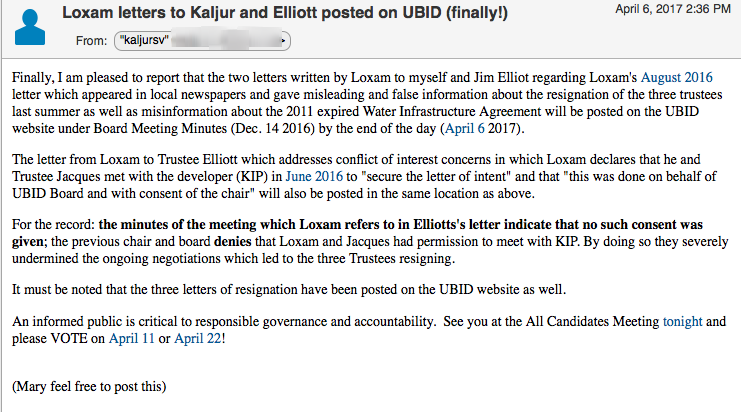 Conflict of interest by Jacques and Loxam who negotiated a preliminary water agreement with the developer without the consent or authority of the Board of Trustees on June 7, 2016, the day after the developer had agreed to a Memorandum of Understanding with UBID. In the letter addressed to Jacques and Loxam from the developer and presented to the Board of Trustees indicates the developer, Loxam and Jacques had been discussing the agreement for ‘many months’. Why trustees Loxam, Jacques and Bitten voted to enact the force majeure clause in the expired 2011 WIA after being repeatedly warned of the flaws in that expired agreement by fellow trustees and the plea of then Administrator Kevin Douville? 500 connections which violated our water license and put landowners at risk of being sued as the landowners of Naramata when they could not provide water as promised to a developer. When trustee Bitten was asked why he voted to approve the old agreement he stated they were asking for advice. When he was corrected he admitted he voted to resurrect the old agreement but stated that in the end they advised the developer the agreement was no longer valid. We all knew this – why won’t this question be answered honestly? Why did elected officials intentionally vote for something that could be devastating to our community? 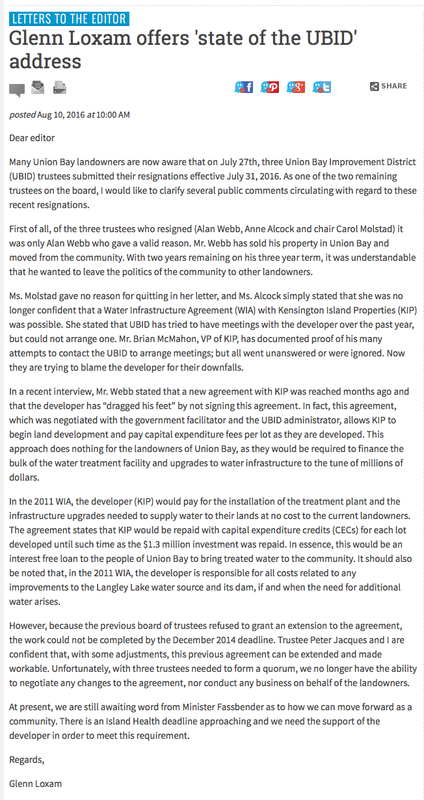 Trustee Loxam published false information stating the developer would pay for infrastructure related to Langley Lake and the dam and refuses to admit it was false information. Loxam relies on conversations which supposedly took place years prior to his becoming a trustee and relies on the ‘intent’ of the parties at the time to draw his conclusion. Trustee Loxam’s defence of the accusation of conflict of interest with the developer falls flat due to the above mentioned letter from the developer regarding ‘many months’. 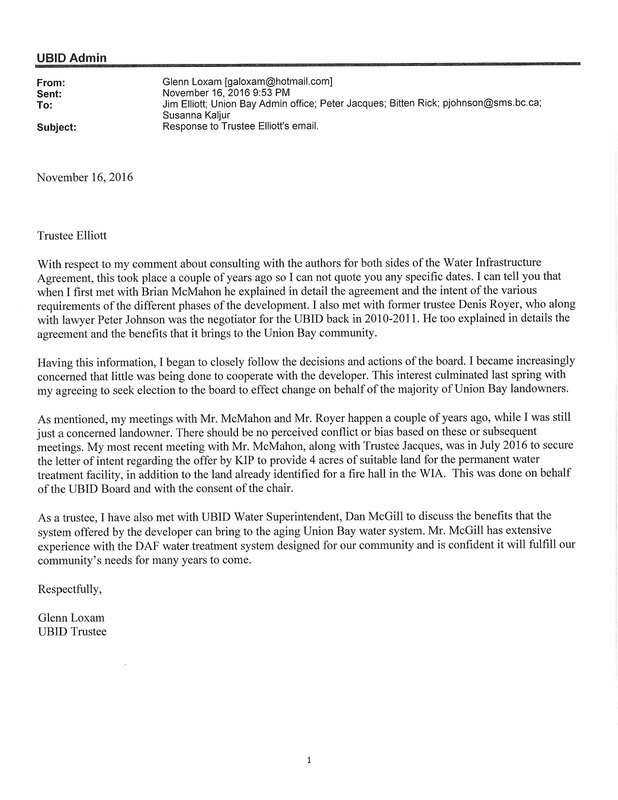 Trustee Bitten’s involvement in the Oct. 19, 2016 all candidates meeting and his subsequent apology on behalf of the Union Bay Improvement District to Lone Jednorog who has since publicly admitted Bitten, Jednorog and Haraldson were there only to advise those already gathered that those hosting the event were a ‘disgusting group’. 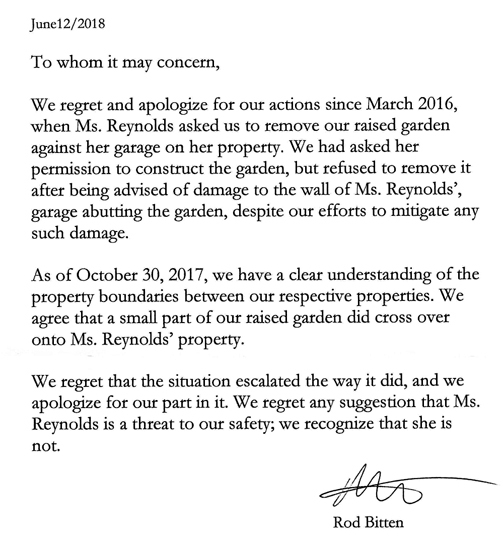 Bitten’s apology was recorded in the minutes of the Nov. Committee of the Whole meeting. “My point is that as trustees that we are supposed to be working as a group, a group of people and showing leadership in our community and these things….our community……our community is broken, and part of our job here is not to fix the water, that’s not our biggest job. Our biggest job is to make this community…..um…..get back together again, and these sorts of incidents are never going to resolve that problem.” Is this the leadership Union Bay deserves? Trustee Bitten’s obvious bias towards KIP during his campaign in Oct. 2016 and all his actions since including his support of the almost 2 years expired 2011 WIA in spite of the fact he stated in Oct. 2016 he would sit down with someone who could explain the agreement and if there were issues and that his mind was not made up. Obviously, this was not done. He claimed the agreement was transparent had been studied to death, 24 hours a day, 7 days a week. Complete lack of response to questions submitted. Written letters to the board go unanswered (fine not to answer rude ones) and questions at the board meetings are limited and simply cut off if the chair doesn’t want to address the question(s). Absolutely no accountability. False information provided without any thought to accuracy. 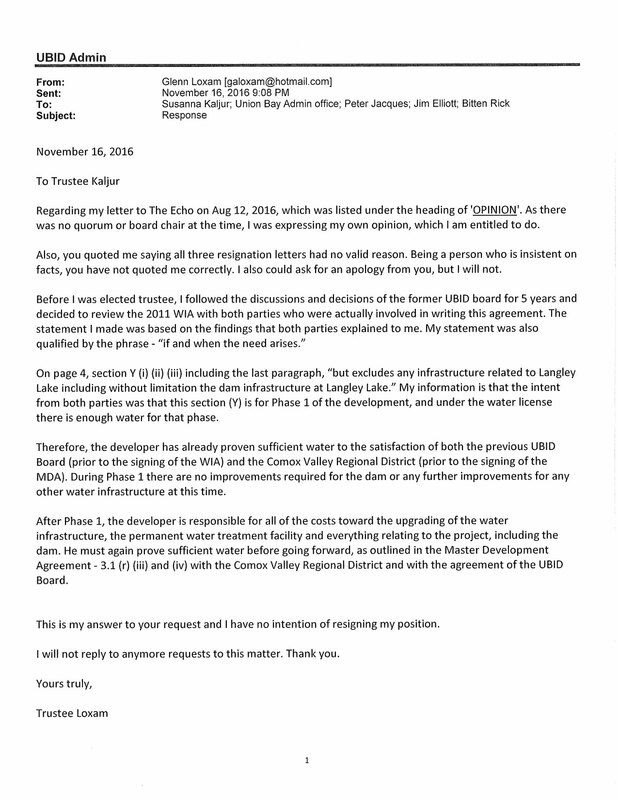 Trustee Bitten stated UBID would have to give water connections to 300 people if there was a request and attributed it to ‘the ministry’. Chair Jacques responded falsely to the question as to why these trustees were championing on behalf of the developer when they voted to resurrect the expired agreement by stating “it was his understanding either party could enact the force majeure clause.” This proved to be false according to the letter received from UBID’s legal counsel. Chair Jacques admitted to never getting legal advice on the expired 2011 WIA and stated “it was just my opinion’. A trustee who neglects to educate himself or bother with due diligence is a danger to this community. This is my short list and the most pressing issues, in my opinion. I simply do not have faith in any elected officials who cannot respond honestly to questions and this board has proved they will do everything possible to prevent them being accountable as they promised. This is the opportunity to deal with these issues now. The Ombudsperson’s Office ask that people contact the offending party and attempt to resolve the problem. This is my first step and I expect to see some changes in the way this board has operated prior to their orientation. 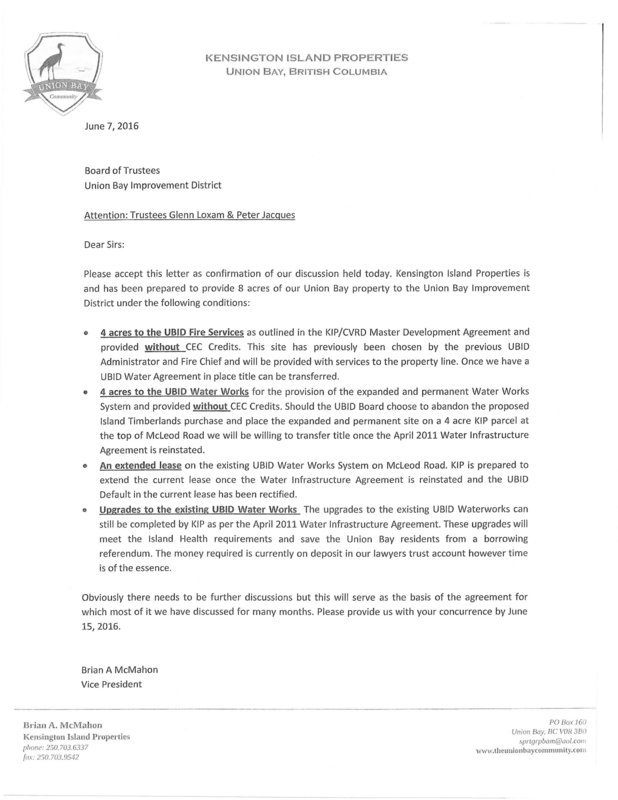 Next Post Did Kensington Island Properties aka 34083 Yukon Inc. Meet the Regional District Deadline by Today?